NEW YORK — Sometimes beauty is trumped by the beast. After bullish expectations and an aggressive marketing campaign for an image considered the quintessential expression of modern horror, Sotheby’sNew York sold Edvard Munch‘s 1895 “The Scream” for $119.9 million on Wednesday night, setting a record for the most expensive artwork sold at auction. AT THE AUCTION: Can you guess the price? Munch’s “The Scream” achieved another milestone: It now ranks as the most expensive drawing publicly sold. For this version of “The Scream” — one of four — is best described as a crayon or pastel drawing, not a painting, on board. The Munch Museum in Oslo owns a pastel as well as a painted version, while the National Gallery of Norway holds the earliest painting, dated 1893. Judd Tully, the art-market expert who is editor at large of Art+Auction magazine, said it was hard to identify the potential pool of buyers. 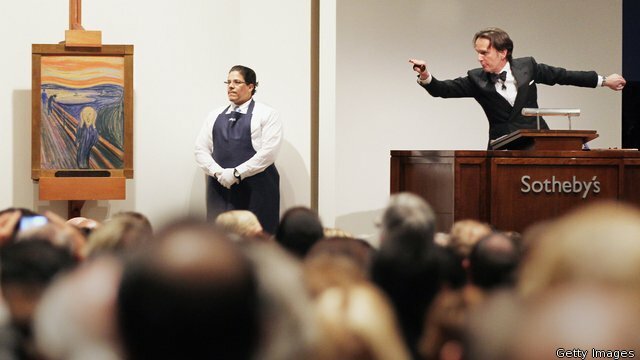 “Under a dozen collectors have been identified who would buy something north of $50 million, and the number gets lower as the prices go up,” he said before the sale. The central image in this artwork is the gaping-mouthed, skull-like face and twisting torso that people know so well from reproductions, cartoons and a seemingly endless stream of merchandise, from shower curtains to neckties. The location depicted is Ekeberg Hill, an overlook point in the south of Oslo that was known as the scene of suicides.